Unfortunately, the scenario described here is not a terribly uncommon story among Labrador owners and those that hunt with them. Charlie’s disease, exercise-induced collapse (EIC), is one of the most common inherited diseases of Labradors and just one of over 15 different inherited diseases of the Labrador that can now be prevented through the use of genetic testing. Knowing which dogs to test, when to test, and what to do with the information obtained from genetic testing are all of the utmost importance in your goal to make sure that your dogs are going to be able to work with you in the field at a high level for the longest amount of time possible. Thus, genetic testing can significantly improve the odds that you are to receive the largest return on your investments in time, training, and devotion. Current veterinary methods to improve the health of a canine blood line involve performing extensive health clearances on both parents prior to breeding and using this information to tailor your selective breeding practices. These health clearances, including hip and elbow radiographs (“x-rays”), echocardiography (ultrasound of the heart), and eye examination (CERF) have become mainstays of the dog breeding world. In addition, over the past 20 years (and particularly the past 10 years), the number of known mutations associated with canine inherited diseases has rapidly increased, thus, allowing for the development of genetic tests which have now also become an integral part of parental health clearances in many dog breeds. Ideally, all breeding pairs should have thorough health testing, including genetic testing, performed PRIOR to breeding in order to improve the overall health of any blood line. Once both parents have been tested, any pups born from parents that are clear for the same genetic mutation, Clear by Parentage certificates can be ordered for those pups. In order to use the information obtained through genetic testing correctly, understanding the way the disease is inherited is crucial. Most inherited diseases of dogs are inherited in a recessive fashion meaning that dogs must inherit two copies of the mutation (one from each parent) in order to be at risk or affected with disease (this is how EIC is inherited). Dogs inheriting only one copy of a recessive mutation will not develop disease from that mutation, but can produce affected puppies if bred to another dog that is also a carrier of the same genetic mutation (approximately 25% of the puppies from a carrier to carrier breeding will be born affected with, or at risk for, the disease). Therefore, in order to prevent producing affected puppies, dogs carrying one copy of a recessive mutation should only be bred to a dog that has not inherited the same mutation. Several other modes of inheritance play an important role in the world of canine genetics and mammals in general. Descriptions of each type are beyond the scope of this writing, but can be found here. 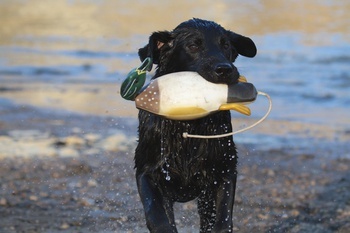 If your main passion for hunting exists more in the field or stream rather than the dog kennel, purchasing a hunting dog from a trusted source may be your best bet. If purchasing a dog from a kennel that has already performed health testing on its breeding stock, it is important to ask for hard copies of the parents’ test results and to know which disease tests have been performed. This is because it can be assumed that puppies will be clear of any genetic mutation for which both parents have also been found clear from a reputable laboratory. However, if both parents have not been tested for applicable genetic diseases or have only been partially tested, it may be worth your expense to purchase this testing on the puppy prior to taking possession so that you don’t get stuck with a dog that may drain you both emotionally and financially with its inherited health woes. Some of our clients have even requested that the breeder have genetic testing performed on their pup as a condition of sale. Paw Print Genetics is one of many laboratories offering canine genetic testing. Paw Print Genetics offers the most extensive list of genetic tests for the Labrador retriever in the industry. These tests are broken up into two testing panels, the Labrador Retriever Essential and Supplemental panels. The Essential Panel offers testing for the most common and most concerning of the diseases known to be inherited by Labradors. The Supplemental Panel offers testing for rarer disorders of the Labrador retriever. It is recommended to test potential breeding stock or a prospective new puppy for all inherited disease mutations known because you truly “don’t know what you don’t know” when it comes to the genetic health of any individual dog. If you have questions about how to improve the genetic health of your kennel or have questions about how Paw Print Genetics can help you identify potential inherited disease concerns in your favorite canine hunting companion, feel free to contact us at AskUs@pawprintgenetics.com or call our laboratory at 509-483-5950 (Monday through Friday; 8 am to 5 pm Pacific time) to speak to one of our knowledgeable staff members.